From 30 June 2017, our in-house magazine IAB-Forum will be available online only. Instead of publishing two printed editions per year, our readers can now benefit from up-to-date articles and information every week. This shift not only assures more up-do-datedness and faster and free access to the content from everywhere in the world, it also offers additional multimedia content such as video, audio and interactive graphics. IAB-Forum continues to be synonymous with scientifically sound articles of assured quality that have been edited diligently and reflect the IAB's full range of research activities – in language that is easy to understand also for practically minded people. As previously, the magazine will feature articles and serials that focus on relevant labour market topics. Additionally, the magazine includes an international section with articles in English that mainly address foreign experts. Interviews, portraits, conference reports and information about important new publications make the offer complete. The articles of the printed issues published until 2016 are equally available as a free download. Abbau der Arbeitslosigkeit - geht noch was in der Arbeitslosenversicherung? 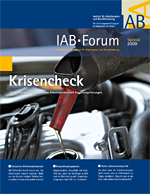 The IAB-Forum is published only in German. Selected articles of this special edition are translated into English.